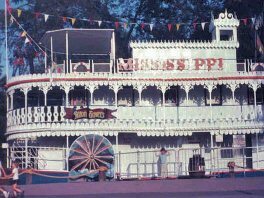 The Mississippi Showboat once stood on the outer edge of Merrie England, opposite the Swan Boats where the old Park Railway entrance now stands. The attraction was themed to look like a typical Mississippi Steamer, like those seen in the musical Show Boat. It was actually more like a fun-house, with moving floors, magic mirrors, rotating barrels and such, like you would expect to see at your local fun fair these days. The boat also played host to a Dixieland Jazz Band, that used to play music from the decks of the boat. The attraction was removed in 1996 after several years of closure, when the area was being prepared for the rebuilding of the Park Railway, which itself disappeared a little while later.